The surprise was part of a reveal of the 2018 Ford Expedition, which goes on sale this fall. The Dallas Cowboys teamed up with Ford to reveal its latest Expedition vehicle by gifting one to a local Dallas first responder and his family. The experience was turned into a video, which was incorporated into a reveal presentation by Ford and the Cowboys and broadcast on Facebook Live. The 2018 Ford Expedition goes on sale this fall. Ford began planning for the Expedition reveal campaign in late 2016. "Texas is the largest full-sized SUV market in the U.S.," explained Becky Sanch, SUV communications manager, Ford Motor. "We really thought it was very important that this audience got the first look at the new Expedition." Last fall, Ford and offensive linemen from the Dallas Cowboys surprised firefighters at Station 43 in Dallas by helping renovate their space. Looking to continue its commitment to first responders, Ford was inspired by the personal story of Garrett Rice, a battalion chief for Colony Fire Department near Dallas. "[Rice] and his wife had two children and planned on adopting another boy," said Sanch. "When they went to go pick up this boy, they realized he had three other siblings." Rice and his wife went on to adopt all of the siblings. Ford decided the Rice family would be a great fit to be featured in a brand video and receive a new Expedition. The campaign team began discussing the reveal opportunity with the Dallas Cowboys in December and worked on the content for the Half Dozen video – named after the fact that Rice now had a family of eight people – with Global Team Blue in mid-January. The goal was to create content that could be amplified across social platforms. Last May, WPP rebranded Team Detroit, Blue Hive, and Retail First under a single global identity called Global Team Blue or GTB. The primary client is Ford Motor. On February 2, the PR team held embargoed media sessions at Ford headquarters in Dearborn, Michigan. Roughly 40 media outlets were on-hand for the sessions, including Detroit-based media such as Detroit Free Press, Automotive News, and The Detroit News, in addition to other outlets such as Wired. As part of the Half Dozen video, Dallas Cowboys linebacker Sean Lee met with Rice and his family to invite them to a Cowboys game for the upcoming season. Under the guise of taking photos together outside Rice's station, Lee surprised the family with a new Ford Expedition. On February 7, the Half Dozen video was incorporated into the Facebook Live reveal event at Ford Center at The Star, the main practice facility for the Cowboys. The speakers at the reveal event were Joe Hinrichs, EVP and Americas president, Ford Motor; Stephen Jones, Dallas Cowboys’ COO and EVP; Todd Hoevener, chief programming engineer for the Expedition; and Michael O'Brien, Ford SUV group marketing manager. 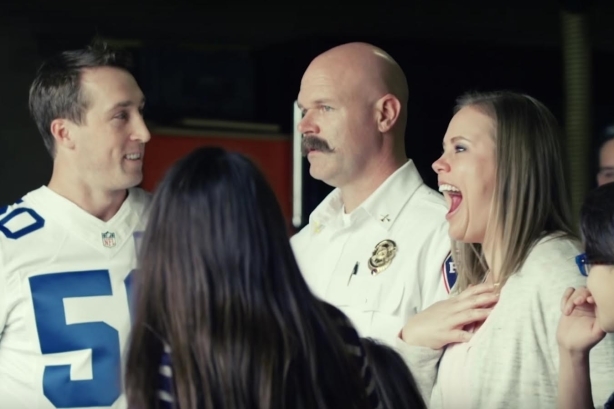 Later that day, the co-branded video with the Rice family debuted on Dallas Cowboys’ branded digital channels, including Facebook, YouTube, and Twitter. It was then shared through Ford's digital channels. On February 8, the PR team headed to Chicago to participate in embargoed media sessions leading up to the Chicago Auto Show. The 2018 Ford Expedition was on the floor of the show, which took place from February 11-20. The Expedition reveal campaign generated more than 600 stories during the week of launch, including features in USA Today, Associated Press, The Detroit News, TopSpeed,and Fire Engineering. From February 7-9, Ford’s Expedition page on Ford.com received more than 101,000 visits, which made up 75% of Expedition site traffic for the entire month. On Facebook, the Half Dozen video was viewed by 679,000 fans. The video saw more than 1 million views measured across YouTube and Facebook. In addition, the Facebook Live reveal event had more than 135,000 views. Using data from Google Trends, the campaign team found that the reveal drove the highest level of Expedition search interest in more than five years.